Published on 29 June 2008. I once said that on this site, book reviews are much like buses: You wait six months for one, and then several come along at once. Never has this been more true, as I kick off the promised Summer Books series of reviews, which is being published both here on sjhoward.co.uk and over on Trinity Mirror’s Gazette Live. At this point, I should declare an interest. John Humphrys has, over the past four years or so, had the Herculean task of waking me most mornings. His voice, as presenter of Today, has permeated its way into my semi-conscious mind hundreds of times; and when someone’s voice has woken you that often, you feel you know them pretty well. 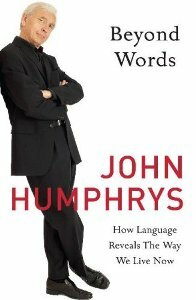 Therefore, provided Mr Humphrys’ book was marginally better than The Da Vinci Code, I was bound to like it. In contrast to Lynne Truss, who, apparently without irony, lamented the decline of formal English in an unnecessarily conversational grammar guide (Eats, Shoots and Leaves), John Humphrys takes a more reflective and analytical approach to changes in language. His tone is equally conversational and laced with humour, but without the repetitive vitriolic condemnation of the reader typical of Truss. Humphrys’ is a clear, easy book to read. Perhaps it’s the way his voice is imprinted on my brain, but his book reads almost as if one is in the room with him, and listening to a well-argued, highly entertaining monologue. And, unlike lesser authors, Humphrys is not trying to argue that misplaced apostrophes are the cause of social decline: He takes a reasoned approach to his arguments, which makes his conclusions seem all the more valid. All-in-all, Beyond Words is a great read. It’s interesting and informative, while still be entertaining enough to hold your attention on a nine-hour long haul flight or a relaxing stretch on the beach. This summer, I’d highly recommend it to anyone with even a passing interest in the English language. This 1,343rd post was filed under: Summer Books, Books, Gazette Columns, John Humphrys, Lynne Truss.